My daughter’s birthday is on Friday and I still have lots to do, so this weekend I will mostly be consumed with party planning and preparations. I always make the kids a birthday banner for their party and it is usually somewhat theme related. Although we hadn’t really planned a theme for this year, she did want to take the girls sledding, so I opted for a “snow” theme ~ not exclusively, but just to give me some directions in pulling things together. I got my inspiration for the little bit of decorating I will do, from this awesome purchase I made on Thursday evening. I found some Christmas clearance items at Sears for 90% off. 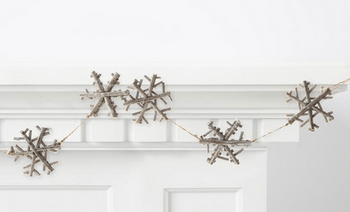 This snowflake garland was just too adorable to pass up. The original price was $59.99, but I picked up two strands for $6 each. I absolutely love a great deal and this was one of my best! Don’t you just love the look of the snowflakes made from twigs! So, I decided to go with a bit of a rustic look. I picked up a roll of the brown parcel wrap paper used for packaging up mail and this will be used for her birthday banner. I plan to stick with a primarily brown and white look. Although I am just beginning to pull this together, I am planning to incorporate several snowflakes of different kinds. I was trying to think of a way to create a large snowflake stamp, so that I wouldn’t have to hand paint them all. I have a small stash of paper towel/toilet paper rolls and I figured I might be able to rig something up for my snowflake theme. Here is what I initially came up with. 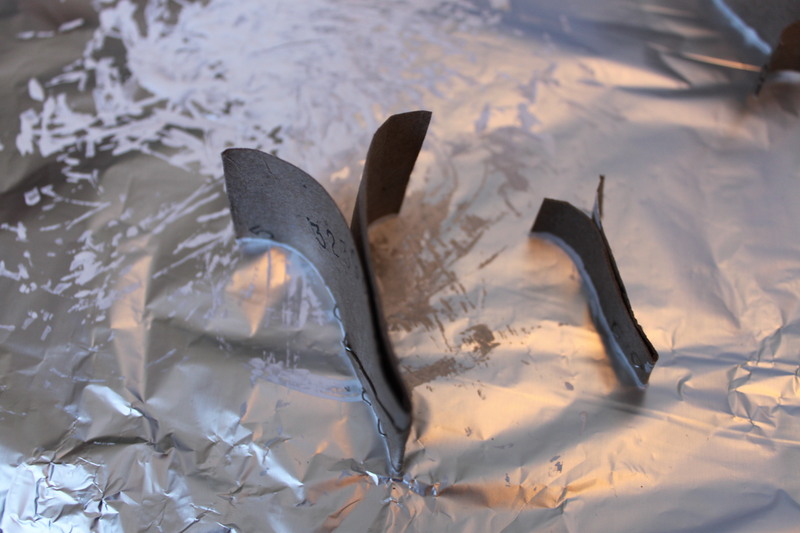 Fold the cardboard in the opposite direction to its natural curl and then staple it along the centre fold, to a cork. Staple the cardboard on a cork. I repeated this process 6 times, and this is what I came up with. Dip in paint to evenly cover the surface. Make prints. The concept was great and it worked okay, but I knew that it would be way too finicky for making lots of snowflakes. The problem was that despite my efforts to create an even base for printing, you had to play around a bit and ensure that each little arm of the snowflake made contact with the paper. This would be totally fine if you were making a few, but I planned to make quite a few and don’t have the patience for that. So, I decided to take it back a few steps and this is what I ended up with. I made two different sized “arms” exactly as I had in the original snowflake, but didn’t attach them to anything. I simply used a cork to make a circle for the centre of the snowflake and then was able to quickly add 6 “arms” around the circle to create my snowflake. I did the exact same thing with the smaller one and used the eraser end of the pencil to make the circle print in the middle. Although it means actually doing 6 prints plus the circle for every snowflake, it seems to be much easier to get a nice even print and faster to do. I have only played around a bit and haven’t yet done the banner, but I am thinking I could easily take a brush or even the eraser tip of the pencil to add other little lines and dots to add some variety to the basic snowflake print.